It's that exciting time of year for many young dancers, time to buy their first pair of pointe shoes! I was recently asked my opinion on when a young dancer should go on pointe and I remembered that this was a topic that came up with the Royal Academy of Dance (RAD) last year. The RAD emailed me to ask the below questions as part of a review they were doing on the correlation between age and going on pointe. I thought it might be useful to include my answers in the blog below (which they were happy for me to share). I have also attached a couple of links from media articles generated off the back of their article in the RAD dance gazette. - At what age did you first go on pointe? - Was this the right age for you? Yes, I think so but this is difficult to determine of course. I didn't have any injury issues until I was much older and I was fairly stable on pointe, I think if I had waited a year I would have struggled to get up to speed relative to my peers and it would have been demotivating. 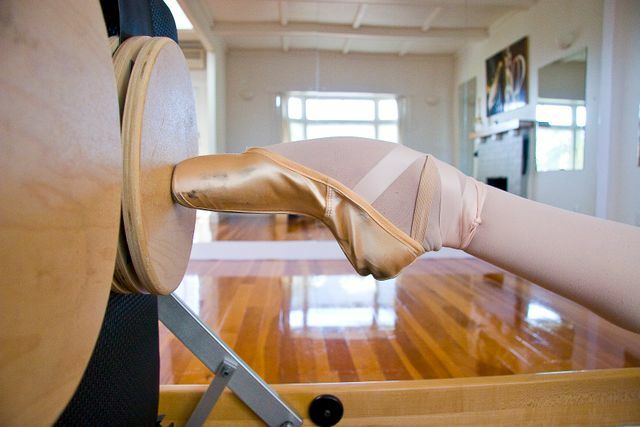 Under my teacher at the time my transition to pointe work was very graduated which was helpful. In fact, I think that how you go on pointe, may be more important than when, within reason. I think a very graduated approach with a few months of rises only, then gradually introducing more loaded and more complex movement is key. As dance teachers, we may be better to focus on having enough time to build good foundations and habits in students rather than waiting till they are older and have them start at 13 and then be under pressure to have students performing variations on pointe within a few weeks. - Does going on pointe earlier mean you are a better dancer? No I don't think it does. I'm not totally on top of this but, at Dance Pilates (https://www.facebook.com/DancePilates/) we do try to keep up with and, stay abreast of the latest in dance research and my physios and I haven't seen any studies or research that relates age on pointe to dance ability nor, age going on pointe to injury risk for that matter. The 'evidence' so far seems to be largely anecdotal (Note: there is a study which demonstrated that more than 60 minutes on pointe per week increased injury risk but this was in non elite dancers across a broad age range 8-16 years and did not define what they were actually doing on pointe, and only included two subcategories less than or more than 60 minutes - have attached just in case you want to review this - Steinberg article). - Do you feel that there should be a standardised age for young ballerinas to go on pointe or that teachers should deal with each child on a case-by-case basis? A case by case basis would be ideal, however this is often impractical and puts more pressure on dance teachers in a number of ways, particularly given the numbers and diverse range of students there may in a class. Perhaps guidelines with a suggested age bracket with technical and strength/stability outcomes that are desired would be best? Age is not a good indicator of skeletal maturity nor indeed and importantly, technical ability. So, instead of age perhaps we should ask does the dancer pass a baseline level of functional and dance specific strength/balance etc indicators or measures in conjunction with consideration of range of motion (stiff ankle vs hypermobile)? With regard to skeletal maturity - girls will typically be hitting their peak growth around 12yrs (see attached slide which one of our physios took a picture of from a physio conference recently). It is before and around this age that 'volume' or 'training load' and the need to ensure this is graduated appropriately, with a focus on control, rather than strength gains, seems to be really important. It is not until after the peak growth period that it is a more optimal time to focus on strength gains. Incidentally training load (volume + intensity) has been more recently a better predictor of injury risk (see Gabbett 2016 paper attached - this looks at chronic load:acute load ratios which illustrates the point about maintaining and graduating a consistent load without rushing the intensity (which in this case includes the technical demand). It would be great if the RAD were able to identify or commission some research investigating and subsequently recommending and setting some basic guidelines regarding training load particularly in the pre-peak growth period - as this would give the teachers a baseline to work and build from. As I've noted above going on pointe is not just an issue of skeletal maturity but everything else that comes along with this. - What would you say to a ballerina whose friends are on pointe and she is not yet? Work on stability and control of your movement so once you are on pointe you can make the most of it.